How to convert BMP to JPEG in batches? 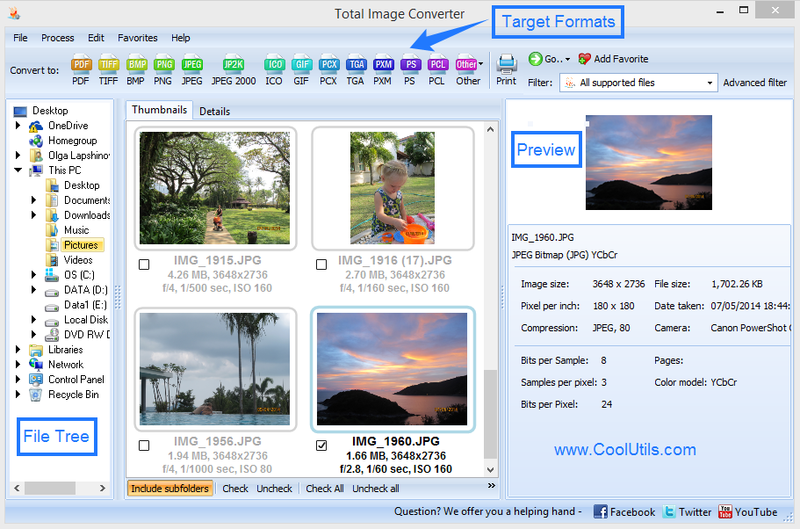 You are here: CoolUtils > Total Image Converter > How to convert BMP to JPEG in batches? BMP (or Bitmap) images used to be very popular among computer users some years ago. In fact, they still are, but a large number of alternative image formats made BMP pictures less widespread. Of course, those who value 100% quality of images still prefer BMP format, but those, who have limited hard drive space, choose JPEG. JPEG is a technology of lossy compression for digital photography (image). JPEG files are much smaller than BMP images and yet guarantee good quality. The easiest way to convert BMP images into JPEG format is to download image converter. 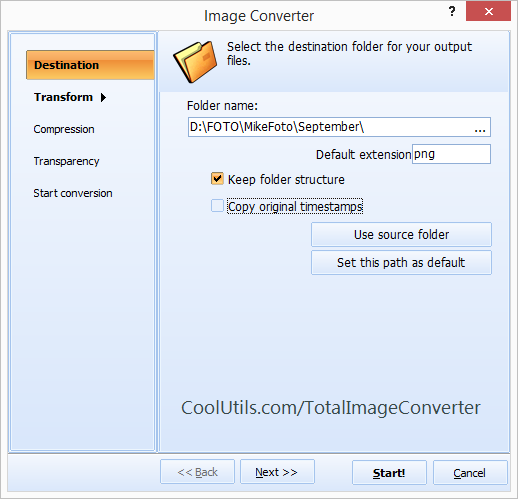 Total Image Converter by CoolUtils is one of the tools that are designed to convert BMP to JPEG in batch. Batch conversion option is very important when it comes to image conversion. As a general rule, users keep hundreds or even thousands of pictures on their computers and it will take ages to convert them o JPEG one by one. Batch BMP JPEG converter is there to help you and process hundreds of images automatically. All you need to do to convert numerous photos with Total Image Converter is select BMP files from the tree of folders, click on “JPEG” to set it as target format and press “Start.” The converter will do the job automatically! 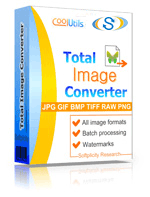 Total Image Converter can be called BMP converter as it is perfectly suited to process files in BMP format. However, this program is also tailored to deal with files saved in such image formats as JPG, GIF, BMP, PCX, PNG, TIFF, and RAW. The choice of target formats is also good, from TIFF and JPEG to TGA and PS. 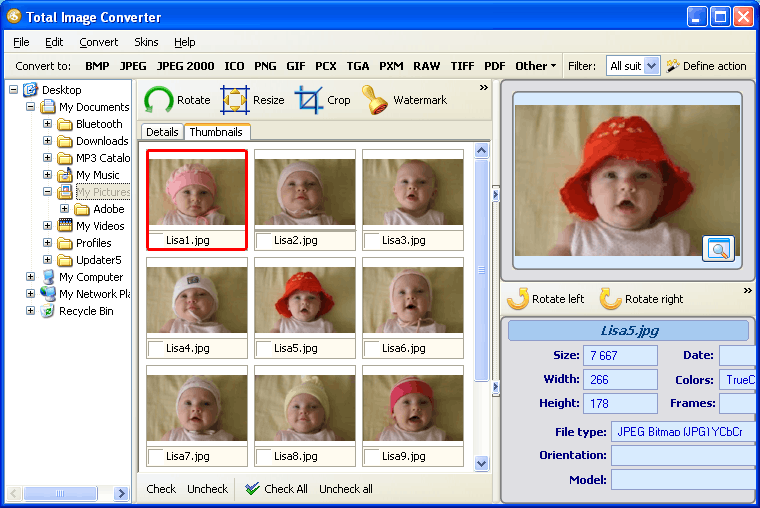 In fact, Total Image Converter is more than just a converter. This program is also great for image editing. You can crop, rotate and resize photographs with the help of this CoolUtils tool. Also, you can add watermarks to images in order to protect them from unauthorized use. To try Total Image Converter, download its 30-day trial version. It is absolutely free so that you can evaluate the quality of the program and make a competent choice!